Revolution Slider Error: Slider with alias case_lametro not found. LA Metro Taps into Real-time Internet of Things Payments. LA Metro, owned and operated by the Los Angeles County Metropolitan Transportation Authority (Metro) started service in 1990. Today LA Metro has 80 stations, 187 bus routes, and serves 1.4 million passengers per day. The Metro TAP program offers a state-of-the-art transit card that uses smart chip technology that stores all of a passenger’s transit information and balances. Riders can simply tap their card each time they board a Metro service. Los Angeles County uses Jitterbit’s API integration platform, Harmony, to dramatically improve the experience of Metro’s 1.4 million patrons by connecting their smart cards with the online TAP program in real-time for seamless access to their account information and the ability to refill balances from any device. LA Metro employees also have real-time visibility into rider information. Connected by Harmony, TAP information is now accessible across the web, mobile, kiosks, buses and trains. Real-time APIs ensure that riders can access up-to-date account information, remaining balances, user profiles and more from any device, any time. Hear how Invoke Technologies uses Jitterbit to help LA Metro improve the customer experience. Fragmented manual processes and swivel seating. Siloed and redundant data locked in legacy stores. No centralized reporting and visibility across network. Integration relied on one-off applications and manual work. Improved experience for 1.4 million of patrons. Real-time visibility to massive volumes of historical data. 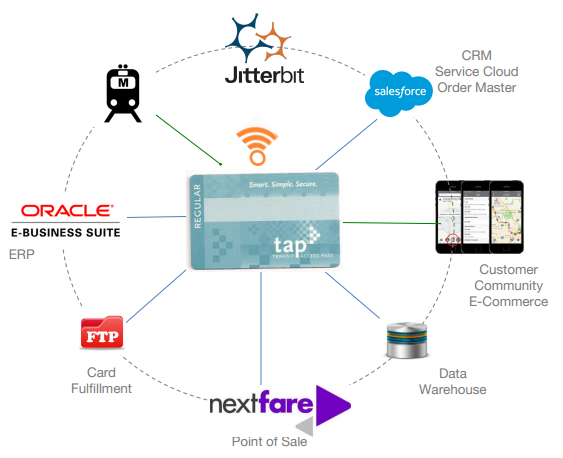 Orchestration of patron card transactions across web, mobile, kiosks, buses and trains through APIs.